Whether it's pie a la mode in the summer, or still-warm from the oven on a cold winter's day - or as part of a Thanksgiving feast - homemade apple pie is always a crowd pleaser. You can start with your own newly-picked apples, or use a can of prepared filling. There's always something heart warming about the aroma and taste of a fresh baked apple pie. This is a basic recipe for good ol' American apple pie, and assumes that the crust can be easily store-bought. If not, here's a pie crust recipe that's a classic. 2. In a small bowl, combine sugar and cinnamon and mix thoroughly. 3. Arrange apple slices in layers in pastry lined pie plate. Sprinkle each layer with sugar and cinnamon. Dot top layer with small pieces of butter and cover with top crust. Seal top and bottom crusts by pinching all around or using a fork to seal the top and bottom layers. 4. Place in oven and bake for about 35-40 minutes or until crust is golden brown. • When using fresh apples to make apple pie, always choose a tart variety such as Granny Smith, Cortland, or Golden Delicious. Tarter apples have more pectin, which means they hold together more firmly while baking. • Before adding them to the pie, warm apple slices (a quick zap in the microwave will suffice) and mix with sugar and cinnamon for a sweeter filling. • Always keep pie crust dough refrigerated before working with it. Cooler temperatures help preserve the dough's elasticity, resulting in a flakier crust. • Brush the top crust with a beaten egg yolk before baking. It will lend a deeper golden brown color and add a shiny, professional glaze to your fresh-baked apple pie. Pastry Wiz How To Make An Apple Pie - Find simple step by step instructions that lead you from apples (Granny Smith recommended) to the finished pie. Directions and tips for apple pie filling, making and rolling out the pie crust dough and anything else you'll need to put together and bake your first apple pie. Best Apple Pie Apple Idea - New York State - Apple Country offers a primer on which apples to use for your apple pie to get a sweet pie or a tart pie. 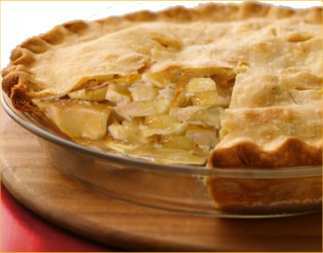 Also check out hints for dealing with apples that get mushy when they are baked in a pie and related resources to tons of great apple recipes.